Falcons v Outlaws T20 Game A Sell-Out! Following three successive victories for Wayne Madsen's table-toppers - Derbyshire Falcons' Friends Life t20 derby, versus Nottinghamshire Outlaws on Friday 5th July, has sold out. Due to unprecedented demand, there will be no tickets sold on the gate and only those with a valid match-day ticket, Six Pack Ticket or Membership card will gain entry to the County Ground. Members and Six Pack Ticket holders are reminded to arrive early to guarantee their entrance. A specific number of tickets have been held back to ensure entry for the projected number of Members and Six Pack Ticket holders, but the only way to guarantee entrance is by arriving with plenty of time in hand. The Club is asking supporters who have already purchased tickets in advance to, wherever possible; collect them from the Gateway Centre between 10am and 2pm, in order to avoid congestion at the gate for the big match that starts at 7pm. Remaining tickets for collection will be available on the gates which will open an hour and a half earlier than usual at 4pm. 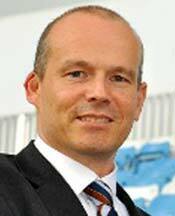 Chief Executive Simon Storey (left) said: "We are clearly delighted by the sellout crowd - Derbyshire's first ever for a home Twenty20 match - and grateful for the tremendous response from our supporters. "Our commercial team has worked incredibly hard to meet demand but, with two in-form East Midlands sides in Friday evening action, the reality is we probably could have sold this match twice over. "Although it is disappointing news for some supporters who were hoping to attend this match, we hope they will take the opportunity to join us for our three remaining fixtures. "We play Yorkshire Vikings and Durham Dynamos at Queen's Park Chesterfield, before finishing our campaign versus Leicestershire Foxes here in Derby - and tickets are still available for all three games." All those attending the fixture are advised to arrive at the ground as early as possible to avoid congestion. Gates will be open at the County Ground an hour and a half earlier than usual, at 4pm. Look out for the new one way system which will aid an efficient flow of traffic into the ground with access via Pentagon Roundabout only. Car Parking, which is available on a first come first served basis, will be paid separately to match tickets upon entry to the ground.